Myofascial trigger point dry needling (MFTrPDN) is a treatment to restore proper function to abnormally behaving muscles. Nodules, or knots, and tight bands that develop in the muscle create localized pain or send pain signals to other locations. The affected muscles become locked and cannot function normally, which restricts movement and causes chronic pain. 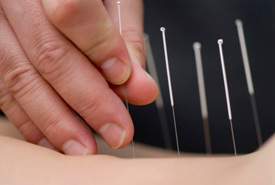 Dry needling utilizes sterile, thin monofilament needles, and relief is often rapid with a reduction in pain and improved function. Contact us to get started!